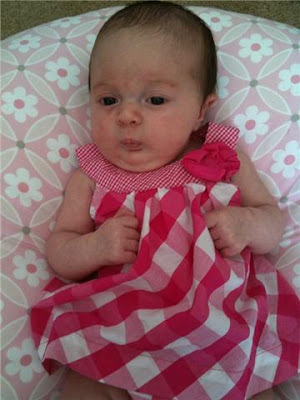 Life with the Lashers: Bella is 1-month-old TODAY! Sleeping Pattern: Bella still isn't sleeping through the night, but averages about 3-4 hours. Eating Pattern: Bella eats 4 ounces of formula every 3-4 hours. Friends: She has mostly adult friends, but has two friends in Utah (Claire) and Tennessee (Sarah Grace). Current Events: Oil spill in the Gulf of Mexico, Cinco de Mayo! Happy 1-Month Birthday, Isabella Eve!